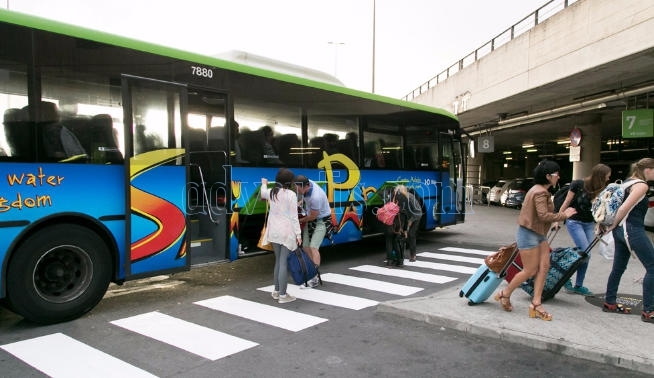 TITSA Tenerife bus creates three direct routes with Tenerife North airport Los Rodeos and Tenerife South airport Reina Sofia and reinforces some of La Laguna, Santa Cruz and the Tenerife North. The Cabildo de Tenerife (Island Council of Tenerife), through its public company Titsa presented the seventh of the ten measures planned to promote sustainable mobility. Specifically, the announced involves the creation of three direct routes with the airports of the Island and the reinforcement of several lines of the metropolitan area and the North, changes that will begin to apply from November 24, 2018. The president of the Cabildo, Carlos Alonso, explained that the new Aeroexpress 20 line will link the capital with Los Rodeos, replacing line 102, which will no longer stop at the airport and save 15 minutes for its users. This line will expand the current service hours, with departures from Monday to Friday from 05.00 hours from the capital and until 00.10 hours from Tenerife North. On weekends and holidays, the frequencies will be every 20 minutes, with departures from the capital starting at 05.40 hours and the last return from the airport at 00.45. At night, the 104 will maintain the same services as before. Also, users of this line, along with those of the 111, may benefit from the offer of use of the parking of the exchangers of Santa Cruz and La Laguna of 3 euros a day, presenting the return receipt with the receipt of payment in cash or through the Ten + card. Meanwhile, the Aeroexpress 30, which also replaces the 102, will link Puerto de la Cruz with the North airport. The new line will have an exit, from Monday to Friday, starting at 05.40 from Puerto de la Cruz and until 23.35 hours from Tenerife North, with frequencies every 30 minutes. On weekends and holidays, there will be services every 40/45 minutes with hours starting at 05.40 from Puerto de la Cruz and last return from the airport at 23.35. Finally, the Aeroexpress 40, which joins the Reina Sofía airport with Costa Adeje, will replace line 451, making the same route, although without making stops on the highway. It will maintain the current schedule of the 451 with departures every day from Costa Adeje, from 07.15 and until 21.30 from the airport of the South, with frequencies every 30 minutes and an estimated time of the trip of 40 minutes. The prices of all routes will be the same as those that have been charged so far. Regarding a connection between Santa Cruz and the airport of the South, the manager of Titsa, Jacobo Kalitovics, pointed out that there is not enough demand to create a new direct line. As for the metropolitan lines, the Head of Institutional Relations of Titsa, Ambrosio Hernández, explained that the 105, which joins Santa Cruz with Punta del Hidalgo, will circulate along the Vía de Ronda at peak times; and, meanwhile, the 050 will increase its frequency in those hours, which will benefit the nuclei of Altagay Pedro Álvarez. Regarding lines 014 and 026, the modifications will allow to improve the hourly frequency between the capital and La Laguna by La Cuesta in the hours of greatest demand. In this way, the 014 will have more trips at peak hours of the midday and the 026 will offer service frequencies every 20 minutes, returning to integrate the 027. Regarding the 054, it will extend its schedule from the Intercambiador de La Laguna to El Ravelo, in El Sauzal, with services later during the week. Likewise, the 056 will increase the number of trips at peak times with the aim of improving the connection between the Interchange of La Laguna, Geneto and Barranco Grande. Meanwhile, the 011 will make the trip from 07.40 hours that until now was the 012. This change will improve the access of El Sauzal students to the Institute of Tacoronte. On the other hand, with the aim of improving the frequency with the commercial zone of Las Chumberas due to the increase in demand, the route of line 233 will have services on Saturdays with a similar schedule to working days. Finally, the 052 will add trips and change its route through the town of Tegueste to the institute and the sports complex and, in La Laguna, will only reach the link Púlpito (old bridge of Los Rodeos). In this way, El Portezuelo, El Socorro and Tegueste will have more frequencies of buses. Questioned on the connections with the south of the island, Carlos Alonso indicated that the Canary Islands government should accelerate the execution of the Chafiras-Oroteanda junction and the third lane of the TF-1 highway, to avoid the collapse of traffic.